Starting today and carrying on through Monday, February 13th, there’s Double GTA$ and RP for a trio of modes plus considerable discounts on Executive Offices, Vehicle Warehouses and an assortment of vehicles from Warstock, Legendary Motorsport and Benny's. Read on for all the details, as well as some additional GTA Online news. Let out any pent up aggression in a trio of explosive Adversary Modes that are all dishing out Double GTA$ and RP for the next two weeks - take down your opposition's heavily-armed behemoth in Juggernaut, get behind the wheel for frenzied vehicular combat in Vehicle Vendetta and engage in the eternal battle between angels and demons in Lost Vs Damned. You can also easily dive right into a double cash bash by launching the special Playlist featuring Vehicle Vendetta II, Deadline IV and Power Play III maps. Launch Premium Races through the Quick Job App on your in-game phone or via the yellow blip at Legion Square. Premium Races pay out GTA$ winnings for the top 3 finishers and all racers get Triple RP. • Jan 30th - Feb 5th: "Storm Drain"
• Feb 6th - 12th: "Up Chiliad"
Rockstar would like to thank players worldwide for continuing to be vigilant in helping them crack down on cheaters and malicious hackers by reporting them through the game’s menu. Rockstar will remain committed to keeping the game environment as fair as possible for all players and are constantly enhancing our abilities to target and ban cheaters - including RP boosters, players soliciting and actively taking part in modded money lobbies and those using in-game mods to grief other players online. And last but certainly not least, Rockstar gives a huge thank you to all the amazing and dedicated players worldwide for an incredible 2016 – a year that was capped by an epic December that saw more players in GTA Online than any month before. For players on PS4, Xbox One and PC that translated to 11 million new CEO Organizations established, 13 million Stunt Races played, 15 million matches of Juggernaut, 24 million new Motorcycle Clubs founded and 10 billion vehicle modifications applied just in December alone, plus tons more varied criminal activity happening each day. 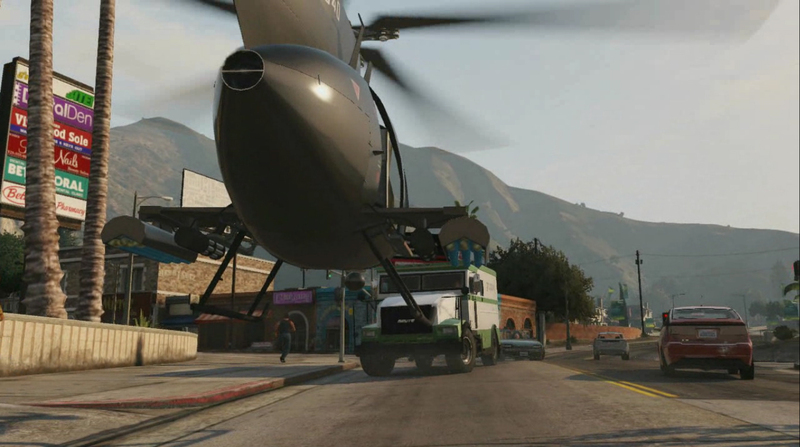 The new Special Vehicles were a big hit with the community also, with the Ruiner 2000 the most popular of the set and the star of some incredible stunt videos as a result. Stay tuned for upcoming info on new updates in the works for GTA Online in 2017. And, if you are a fan of GTA Online, thy highly recommend signing up for the Rockstar Games mailing list at Social Club. They occasionally offer special GTA Online bonuses and discounts to select mailing list members, as well as delivering the latest news on Grand Theft Auto V, Grand Theft Auto Online, Red Dead Redemption 2 and more directly to your inbox. Sign up here. 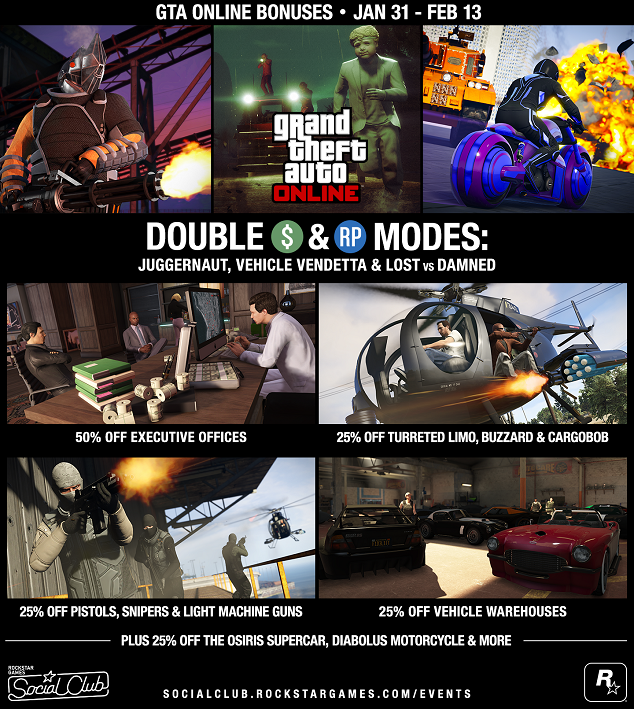 Double GTA$ Modes, Executive Office Sale, More - Sales and discounts for the next two weeks and some other interesting info for new-gen GTA Online.